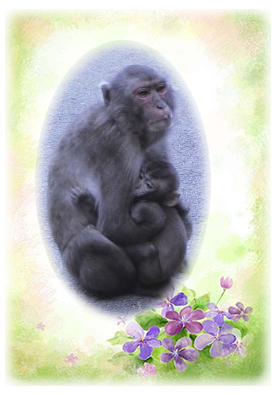 The existence of Sayaka, a wild ape with disabled arms, straining to raise her child in Takasaki Mountain, has touched the hearts of many people in Japan. In Takasakiyama Nature Zoo there is a gathering place for wild apes, which allows them to come down from the mountain at a fixed time everyday to be fed wheat and potatoes. This helps to stop the apes from damaging the crops, and at the same time is a great tourist attraction. Sayaka is a female ape whose arms are both handicapped. She was born with her arms bent inwards, thus unable to use her fingers to climb trees or hold things. Baby apes must hold onto the tummy of their mothers, so having this kind of disability usually means death for the infant. However, Sayaka’s mother raised her by preciously carrying her in her arms. Because she could not pick up food with her hands like the other apes, Sayaka’s body is small from lack of food, and her place in the group is also weak. In December Golden Year 1 (2004), the 11-year-old Sayaka became pregnant for the first time. In human years, this age is around the late 30s. 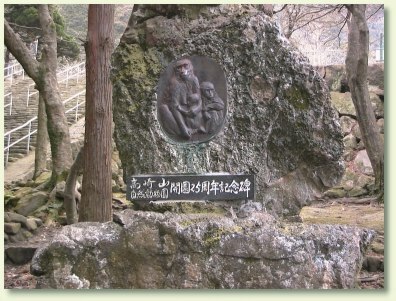 Because apes usually start giving birth at age 5, Sayaka’s was the oldest case in Takasaki Mountain. Since that time, we noticed a change in the way Sayaka ate her food. Before, at the gathering place, she would bring her mouth down to lick the wheat off the ground. When pregnant, she would stand right in front of the zoo keeper handing out the food with her mouth opened as wide as possible to take in as much as she could. It was as if she was thinking of the child in her womb. Sayaka had a difficult delivery. It lasted 2 days instead of the usual 2 hours. She made every effort to take care of this baby, but due to her handicapped arms and loss of too much energy, she dropped the newborn. That night, she returned to the mountain with her child but it was the last time that the baby was seen. After that, Sayaka remained worn-out for a while, and she had been seen crawling to come down to the gathering place. In June Golden Year 3 (2006), Sayaka had her long-awaited second delivery. The baby was a boy, and was named “Genki” (meaning “vigor”). Full of a mother’s pure love, she’d hold her baby to breast-feed him and groomed him with her disabled arms. 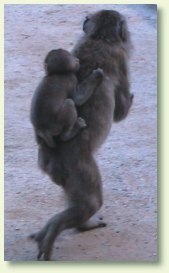 Mother apes are renowned for their love towards their children. This was even more apparent in Sayaka’s case, which was no less than that of a human being’s. I talked with Mr. Kawano, a guide who has watched the apes for more than 30 years. He said that Sayaka had become a little stronger, by giving birth to her child. He also mentioned that it always hurt him to see Sayaka watching Genki fearfully as he played high in the air. At times she sensed danger but could not grab her child to protect him like the other mother apes do. Sayaka seemed to be especially close to Mr. Kawano. He often secretly gave her a small potato from his pocket. It seemed to me that Sayaka had sensed Mr. Kawano’s kindness towards her disability, and had placed her absolute trust in him. In their relationship, it seemed that there was no difference of human and ape. I have two young sons. Remembering the way I used to get all upset over small things, I could not help feeling embarrassed when I compared myself to Sayaka, who was living innocently and straining to raise her child. I have a home, everyday I have something to eat, and my family and I are all healthy. More importantly, I have a Master who looks after me and guides me towards the right path. I feel so blessed and appreciative of all that I have.